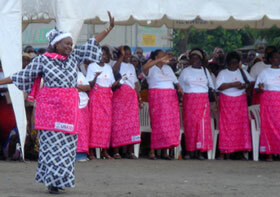 Mama Regina Lowassa, wife of the Prime Minister of Tanzania, and USAID/Tanzania Mission Director Pamela White ushered in the newest season of the Tanzanian family planning radio soap opera, Mama Ushauri (or "Mama Advice" in Kiswahili) in a launch ceremony at a community health center in a suburb of Dar es Salaam in March. 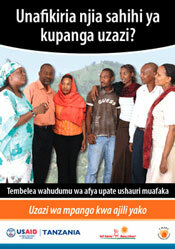 The Tanzania Marketing and Communication (T-MARC) Project, in collaboration with the Tanzania Ministry of Health and Social Welfare's Reproductive and Child Health Section, produces the soap opera. 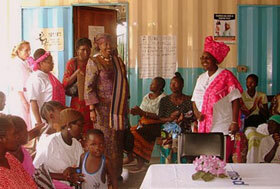 T-MARC is a five-year USAID Private Sector Project (PSP) managed by the Center for Private Sector Health Initiatives. With Mama Lowassa nodding in approval, USAID Mission Director White said at the launch ceremony, "Strong, healthy Tanzanian women are critical for Tanzania's positive growth and development, and a woman who can control her family size has more opportunity to contribute to society, feed and educate her children, and look after her family." Known by many Tanzanians for her straight-talking language and honesty, Mama Ushauri, portrayed as a knowledgeable family advisor, seeks to promote the benefits of family planning while clearing the air around myths and misconceptions about modern contraceptive methods. Mama Ushauri encourages women and their husbands to seek the advice of their health providers and choose a family planning method that is right for them. Told through the lens of three families, the diverse and insightful radio episodes appeal to a variety of Tanzanians, both men and women in rural and urban audiences. In the fictional peri-urban community of Goromonzi, the home town of Mama Ushauri, a young couple contemplates when to have their first pregnancy. Across town, a middle-aged couple with children discusses birth spacing, and an older couple explores permanent family planning methods when a pregnancy scare makes them realize that unless they take action they could become parents again. Together these three families offer compelling characters and behavior change paradigms illustrating how, over time, individuals become aware of the importance of changing their attitudes and practices, adopting appropriate and beneficial behaviors. The families and Mama Ushauri herself encourage the sustainability of new behaviors and reinforce the benefits of improved reproductive health. Now in its third season, the newly expanded episodes are 10-minutes long and air 6 times a week in Kiswahili on prominent national radio stations including Radio Tanzania, Radio Free Africa and Radio One. Periodically, Mama Ushauri hosts a 10-minute "question and answer" show that offers listeners an opportunity to call-in and ask questions about family planning, and allow Mama Ushauri a chance to reinforce key messages. The expanded length of the program, coupled with the call-in show and related interventions, encourage the adoption of the new behaviors promoted on the program. Mama Ushauri's overall messages are that there is a suitable family planning method for everyone and women should feel empowered to go alone or with their partner to the nearest family planning provider and seek personalized information. Through support from USAID and the Tanzanian Ministry of Health's Reproductive and Child Health Section, T-MARC will continue with community support campaigns to ensure that women in Tanzania are able to make informed choices that meet their family's needs.